Stuttgart - It was a tale of two strikers in the Mercedes-Benz Arena as VfB Stuttgart and Bayer 04 Leverkusen played out an entertaining 2-2 draw. Vedad Ibisevic and Stefan Kießling were the goalscorers for their respective sides as they each bagged a brace to ensure the spoils were shared. The result leaves Stuttgart still waiting on their first home win of the season. These two sides had come into the game after gruelling trips away from home in the UEFA Europa League on Thursday night, which resulted in a slow start to proceedings. Aside from a Raphael Holzhauser free-kick that Bernd Leno dealt with comfortably, there wasn't much on offer in the way of goalmouth action from two sides. The crowd in the Mercedes-Benz needed a goal to rouse them, and when it eventually did arrive, the complexion of the contest changed entirely, as Leverkusen were first rewarded for their attacking intent. There looked to be little danger when Daniel Carvajal drove a low cross into the danger area, but the ball somehow crept over the line off the shin of Kießling after Stuttgart goalkeeper Sven Ulreich had attempted to cut out the delivery. 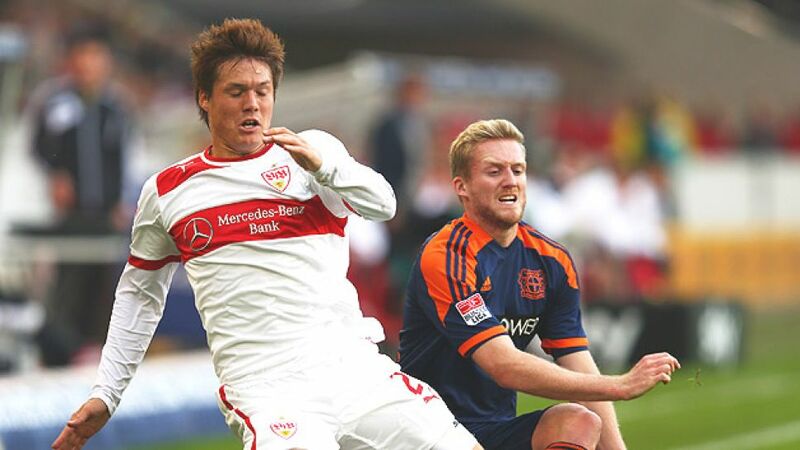 The match was now far more open, with Stuttgart looking to strike back and Leverkusen lying in wait on the break. Labbadia's Stuttgart went in search of an immediate reply and found it just six minutes later when Ibrahima Traore was upended by Simon Rolfes inside the penalty area. Ibisevic stepped up to stroke home the resulting spot-kick, VfB's first goal at home in the league this season. Sami Hyypiä's team then paid for their profligacy, as Stuttgart stole in front, with Ibisevic tapping in from Holzhauser's peach of a delivery. However, Labbadia's charges, without a home win this season, never looked comfortable at the back as their lead lasted just four minutes. Kießling proved he could match his Basnian counterpart, as he nodded in a simple free-kick to restore parity in a topsy-turvy match. As the match entered its closing stages the chances continued to flow. Martin Harnik flashed a strike wide of the target at one end, before a momentary lapse in concentration from Maza almost let Kießling in for his hat-trick. In view of how many chances had fallen to both teams, it seemed the points were there for the taking for the more adventurous side. Yet it was a curiously uneventful ending to the game. Maza and Artur Boka both sent efforts from distance over the bar, while Kießling glanced a header wide of the goal, but in the end neither side was able to find a winner as the both settled for a share of the spoils.